Murgh Musallam masala is delicious dish from Mughlai Cuisine.Normally in Chicken Murgh Musallam,the whole chicken is stuffed with roasted spices but here i am taking big chicken pieces instead of whole chicken.There are long list of ingredients ,while making Murgh Musallam but if we plan it properly ,we can make this Murgh Musallam easily. FOR MARINATION : 1 medium size chicken, 125 grams curd ,1/2 teaspoon red chilli powder, 1/2 teaspoon turmeric powder, 2 tablespoon of ginger +garlic paste,2 green chillies paste and salt to taste. FOR DRY ROAST AND GRIND : 4 tablespoon mustard oil,2 tablespoon pure ghee, 5 medium sized onion,4 big cardamom, 10 black pepper corn ,2inch cinnamon stick, 8nos Almonds, 1 teaspoon cumin seeds, 1 tablespoon coriander seeds,8 cloves,nutmeg powder a pinch, 10 cloves garlic,2 inch ginger,salt to taste,1 cup water and 2 tablespoon coriander leaves. 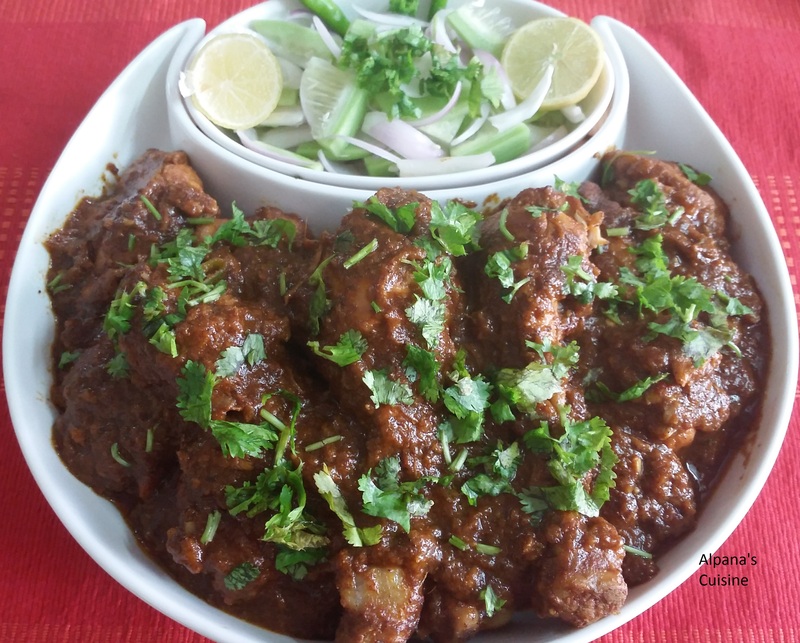 Wash the chicken and make a cut in the chicken pieces (big size pieces / chicken thigh fillet pieces).Take a bowl,mix all the spices for marination with curd . Now rub the marinade over chicken pieces, mix well to coat the pieces completely and leave for 2 to 3 hours. Now roast the spices (cardamom, pepper corn, cinnamon ,almonds,cumin seeds ,coriander seeds,cloves and nutmeg powder) till the nice aroma comes or little darker in colour.Keep aside for cooling. Cut the onion ,fry till golden brown,keep aside for cooling.Now take all the spices ,fried onion ,ginger, garlic and make a paste. Heat the remaining oil in a deep bottomed pan or pressure cooker,put the marinated chicken in the pan and fry till chicken become brown. Take out the chicken pieces from the pan and add roasted spice paste,stir for 4 to 5 minutes , then add chicken pieces and mix slowly well,then add pure ghee, water and salt to it.